There’s no denying that the holidays are packed with sugar. From cookies to candy-studded gingerbread houses to petit fours, the holidays are merry celebrations with sugar on the side (all the sides). 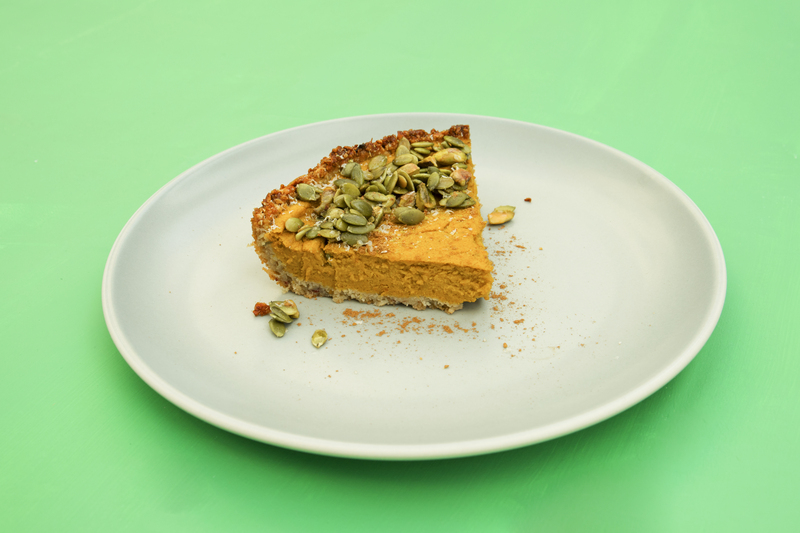 For those who are looking to take a break from all the sugar, or those who naturally prefer less-sweet desserts, our Kabocha Squash Pie is perfect for you. Kabocha squash is a Yumi favorite— it’s a low carb, fibrous fruit packed with beta carotene (which converts to vitamin A), which contributes to blood health, as well as skin and hair health. It’s also a good source of iron, vitamin C, and some B vitamins. We mix roasted kabocha squash with a little bit of almond milk, maple syrup, eggs and spices to make an amazingly creamy filling. The crust is just right— made with cashews, oats, dates, maple syrup and a pinch of salt, it’s perfectly crunchy— and subtly sweet. We top it all off with some more crunch from pepitas, pistachios, and shaved tiger nuts. Crunchy Cashew Crust. Smooth and Creamy Kabocha Squash Filling. Sweet and Salty Pepita & Pistachio Topping. All the textures you want from a pie - without the sugar overload. Begin by draining all of the liquid from the cashews that you’ve soaked overnight for the crust. Place all of the ingredients for the crust into a food processor. Blend until the cashew pieces are chopped well and the mixture is cohesive. Spread the mixture into a pie pan as you would with any pie crust. Make sure that the mixture is spread out evenly throughout. Bake at 375F for approximately 20 minutes, until the edges of the crust are golden brown. To prepare the filling of the pie, place all of the ingredients into a food processor and blend until completely smooth. 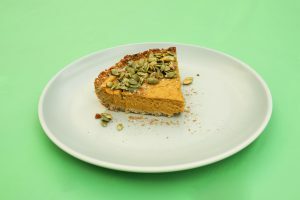 Fill the baked pie crust with the kabocha squash filling, and place it back in the oven for approximately 25 minutes. To prepare the topping, simply combine the pepitas and pistachios in a bowl. Mix in 1 teaspoon of maple syrup and heat the mixture in a frying pan for 2-3 minutes, then remove from heat. Spread the topping mixture along the perimeter of the pie, and top it off with tigernut shavings. If desired, add a dollop of fresh coconut cream and a sprinkle of cinnamon. Serve immediately, or store in the fridge for up to 3 days.